In early 2011, one of the largest earthquakes in history hit off the Pacific coast of Japan. The earthquake, and the massive, 50-foot tsunami that followed, killed over 18,000 people, destroyed over 1 million buildings, and caused over $200 billion in damage. The tsunami also caused a nuclear meltdown at Japan’s Fukushima Daiichi Power Plant, releasing radioactivity into the air. Global demand for uranium—the commodity nuclear plants need to generate energy—tanked after Fukushima. A global supply glut followed. Since then, uranium has been in a brutal bear market. You can see this in the chart below. Readers of my Crisis Investing advisory know Doug Casey and I travel the world looking for crisis markets. The point of this crisis investing strategy is to take advantage of aberrations of mass psychology and pick up elite assets for pennies on the dollar. And as you can imagine, that describes uranium right now. And even before Fukushima, others got emotional because it reminded them of earlier nuclear disasters… like Hiroshima, Nagasaki, Chernobyl, and Three Mile Island. Of course, Fukushima amplified the negative emotions around uranium. After the meltdown at the Daiichi plant there, the price of uranium crashed from around $85 per pound to under $30. Then it continued to slide to around $18—far below the cost of production (which is around $60). Today, it’s hovering around $25. There’s no uranium company in the world that can make money at current prices. Over seven years after the Fukushima disaster, the uranium market is still in the dumps. But it won’t be that way for much longer. 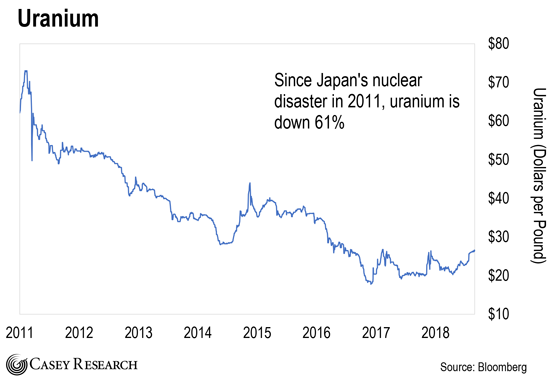 Japan’s timeline for restarting its reactors is a crucial piece of the puzzle in resolving the imbalance in the uranium market. As I told you earlier, the 2011 Fukushima meltdown devastated the uranium market. Japan shut down all of its nuclear reactors, instantly wiping out 17% of global uranium demand. Japan did this despite a government policy that requires it to stockpile at least five years’ worth of energy supplies. This policy dates back to the early 1970s, when a large regional war in the Middle East disrupted energy supplies and rocked Japan. Uranium is the only feasible way for Japan to meet the terms of this policy. It’s simply not practical for a country that lacks resources—like Japan does—to stockpile five years’ worth of coal, oil, liquefied natural gas, etc. For now, Japan has made an emergency exception because of Fukushima. But without energy security, it’s in a very vulnerable position. Especially so because the potential for another large war in the Middle East—and subsequent disruption to the oil market, an alternative to nuclear energy—is greater today than it has been since the 1970s. "Wars are not going to disappear in the world at large. We can’t change human psychology, and that seems particularly true in the Middle East. And the next war we have in the Middle East is likely to be a relatively big one involving Iran. "That means the Strait of Hormuz will almost certainly be cut off, which will make it basically impossible for oil and natural gas to flow from the Middle East to anywhere. This should incentivize the Japanese, who have zero domestic energy resources, to start firing up their nuclear plants—at least if they can put two and two together." Given the rising tensions in the Persian Gulf, Japan would be wise to restart its nuclear reactors as soon as possible. It would be ironic to see Japan suffer from another oil shock during the period in which it suspended the very policy to protect it from one. Eventually, Japan will restart all of its nuclear power plants. And it’s made some progress already. 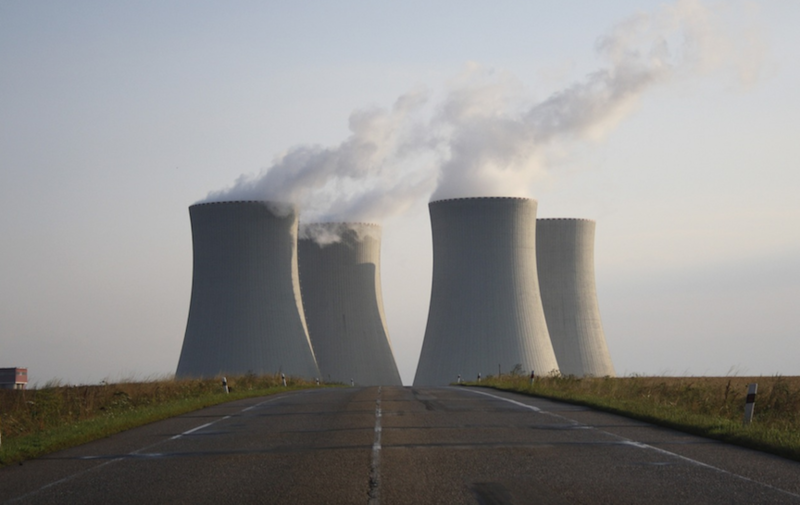 So far, nine out of the 54 nuclear reactors at its plants have been brought back online. Many more restarts are on the way. Admittedly, restarting idled plants is a long, difficult process. It won’t happen overnight. But that gives us a great opportunity to buy quality uranium companies today at a discount. The best place to start your search is companies that operate in stable countries with a strong tradition of the rule of law—countries like Australia, Canada, and the U.S. If you haven’t yet, consider positioning yourself in the top companies in those areas.